The techniques for making decisions, that is, branching, play a central role in complete methods for solving structured instances of constraint satisfaction problems (CSPs). In this work we consider branching heuristics in the context of propositional satisfiability (SAT), where CSPs are expressed as propositional formulas. In practice, there are cases when SAT solvers based on the Davis-Putnam-Logemann-Loveland procedure (DPLL) benefit from limiting the set of variables the solver is allowed to branch on to so called input variables which provide a strong unit propagation backdoor set to any SAT instance. Theoretically, however, restricting branching to input variables implies a super-polynomial increase in the length of the optimal proofs for DPLL (without clause learning), and thus input-restricted DPLL cannot polynomially simulate DPLL. In this paper we settle the case of DPLL with clause learning. Surprisingly, even with unlimited restarts, input-restricted clause learning DPLL cannot simulate DPLL (even without clause learning). The opposite also holds, and hence DPLL and input-restricted clause learning DPLL are polynomially incomparable. Additionally, we analyze the effect of input-restricted branching on clause learning solvers in practice with various structured real-world benchmarks. 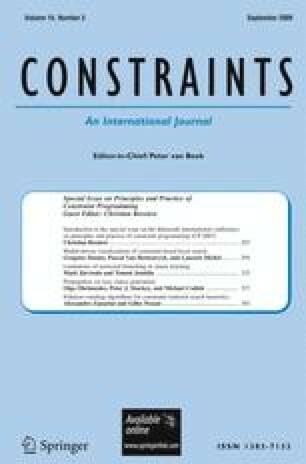 This is an extended version of a paper  presented at the 13th International Conference on Principles and Practice of Constraint Programming (CP 2007) in Providence, RI, USA. The first author gratefully acknowledges financial support from Helsinki Graduate School in Computer Science and Engineering, Academy of Finland (grants #211025 and #122399), Emil Aaltonen Foundation, Jenny and Antti Wihuri Foundation, Finnish Foundation for Technology Promotion TES, and Nokia Foundation. The second author gratefully acknowledges the financial support from Academy of Finland (grant #112016). Järvisalo, M. (2007). Equivalence checking multiplier designs. SAT Competition 2007 benchmark description. http://www.tcs.hut.fi/∼mjj/benchmarks/. Pyhälä, T. (2004). Factoring benchmarks for SAT-solvers. http://www.tcs.hut.fi/Software/genfacbm/.